With the LDF series Laserline is setting the benchmarks for high power diode lasers. Even devices with over 20kW laser power are set on sturdy castors allowing a single employee to move the laser to different locations for start-up in production – a unique benefit. All you need is electricity, water and an optical fiber – and the laser is ready for use at its new site. Thanks to permanent development of our proven active diode cooling technology the system family is optimized to multi-kilowatt power levels even at high beam qualities: 7 kW out of a 600 µm fiber at NA 0.1 in a compact system configuration at less than one square meter footprint. Whether power, cooling or system interfaces: The LDF series can be individually configured and adapted to changing requirements. The systems are available with internal or external cooling system as water/water or water/air version. 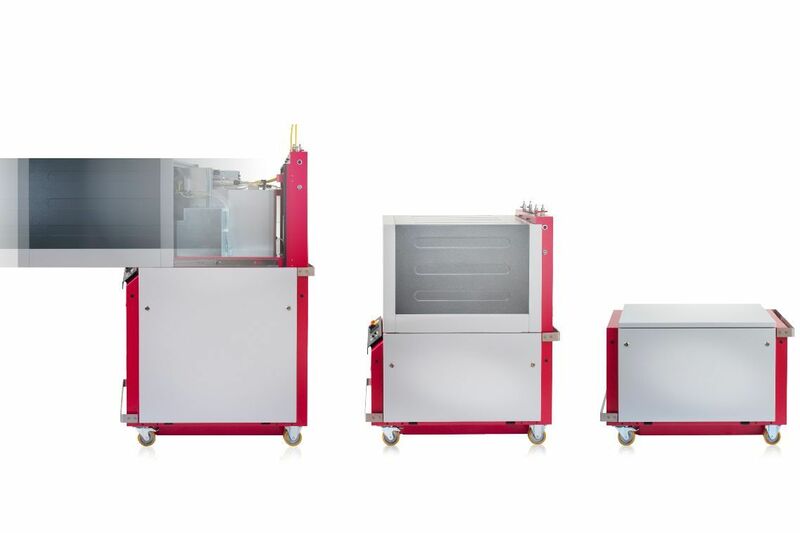 With these Laserline chillers, perfectly aligned to the product line and fully integrated in the control system, high power lasers can now be operated permanently in production with a low footprint requirement. Through the internal networking of all system components malfunctions can be diagnosed in real-time and resolved immediately. The LDF series is one of the most efficient technologies with up to 50 percent electrical efficiency. Due to the mobile hot-plug operation unit LDF lasers can be flexibly monitored and controlled even from a distance. Connection areas and interfaces are easily accessible by an extendable hood. System components can easily be exchanged and in this way production is not interrupted. An industrial, latest-generation Ethernet network combines the system components and interfaces with the central control unit, which monitors the entire process in real time. An OPC-UA interface creates the prerequisites for a platform-independent, vertical and horizontal data communication. It enables the integration of lasers in modern system architectures. All information is available at any time: on the mobile control panel directly on the laser or via network connection in a control center as well as over secured remote access. The beam source contains several stacks of individual diode bars. The number of bars per stack and the total number of stacks depends on the laser output power and the required beam quality. Using a straightforward, patented technology, the beams of the diodes are overlaid to form a single laser beam that is coupled into an optical fiber. In most cases, the modular structure of the laser head allows the system to be fitted with additional stacks if extra power is needed. Laserline aims for maximum reliability in particular for the heart of each diode laser system: the individual laser diode. Very stringent criteria and specially developed test procedures, guarantee that only qualified laser diodes are used. Diode laser systems from Laserline operate for more than 30,000 hours, which is equivalent to 5 - 7 years of production, before diode laser elements may need replacing. Should, despite all precautions, a spontaneous failure of a diode laser occur, Laserline’s pioneer electronic stack management system steps into action. Based on the redundancy concept and automatic system adjustment, faults can be compensated within a few minutes.